As part of our London Craft Week programme at the Geffrye Museum, visit our exhibition celebrating the craft of the letter carver and the power of the hand-made memorial. “A Way With Words”is a major touring exhibition celebrating the 25thAnniversary of the Calligraphy & Lettering Arts Society, with almost 100 selected pieces of calligraphic and lettering work, in a variety of media, to show the huge range of ways to express words visually and beautifully. This exhibition travels to venues in the north, south, east and west of the country, and the vast majority of work will be on display at the final stage of its journey at The Lettering Arts Centre for almost 4 months. In an increasingly visual society, calligraphy has gained popularity as people appreciate the skilful demonstration of scripts and styles. It is also a thriving and popular craft skill that encourages anyone with a love of words to express themselves. Traditional manuscript painting and gilding can be seen alongside many other techniques, such as writing on metals or glass, work with nibs, brushes and other tools, paints, inks and engraving, linocuts and digitally manipulated images. The Calligraphy & Lettering Arts Society (CLAS) is one of the largest western lettering societies in the world. It is based in the United Kingdom and has an extensive membership in Europe as well as many other countries. CLAS is a registered charity that aims to provide educational support for its members and the wider public, as well as raising standards in calligraphy and lettering. It holds a variety of national and international events such as the annual week-long Festival of Calligraphy, day and weekend workshops and touring exhibitions. A fun, hands-on creative session for the mini-visitor as part of our ‘The Lost Words - forget me not’ exhibition. Wild Little Letters! A fun, hands-on creative session for the mini visitor and parent or carer as part of our ‘The Lost Words - forget me not’ exhibition. Join us for a performance of 'Growing Old Disgracefully' by Virginia Ironside to explain the joys and hilarity of life after sixty. Come to the Make Festival to discover art skills and ideas. 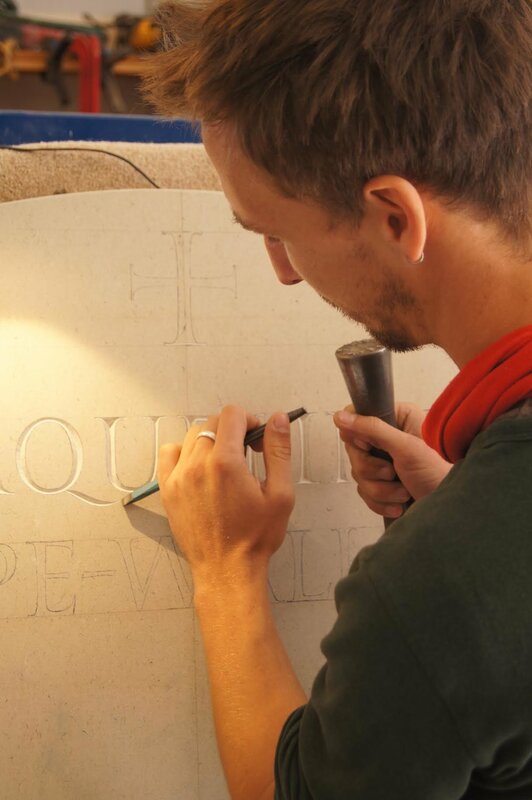 Join letter carver Tom Sargeant as he demonstrates the timeless skill of designing and carving of letters into stone. We are drawn to capture a memory. For centuries, we have commemorated and mourned the passing of lives through memorials. Presenting a time capsule of beautiful memorials drawn and carved by hand by leading letter carvers, this exhibition will show how individual lives can be celebrated with sensitive design and beautiful lettering. The exhibition is designed to uplift and to prompt us to consider how we would like to be remembered. We will present the working drawings and designs of lettering artists, as well as original works from our Art & Memory collection. Among the exhibits on display will be the memorial artwork created with the running vest of Stephen Lawrence, kindly loaned by the Lawrence family. Opening times: Friday-Monday: 11.00am – 5.00pm. Join our curator, Eric Marland, who will share the story of the inspiration for the collection, talk about the significance of the works on display and give an overview of the development of our alphabet - perhaps humankind's greatest invention. This talk is free for Friends but please reserve your place here. Thank you! We look forward to welcoming you. For all other guests it is £10 to reserve your place. Join Rachel at the Chelsea Physic Garden for a talk and demonstration of her work designing and carving artworks such as her 'A Laughing Pomegranate' created for our exhibition 'An Elixir of Letters'. She will take guests on a guided tour of all the works on display in the Garden. While the talk is free on entry to the Garden, please reserve your place here www.chelseaphysicgarden.co.uk/Event/an-elixir-of-letters-talk-and-tour-with-rachel-gundry . Join Martin Cook for a talk about his work and a tour of the garden artworks in our ‘An Elixir of Letters’ exhibition at Chelsea Physic Garden. Tolpuddle Manor dates from 1656 and is the home of Julian Francis, a long-term supporter of the charity. 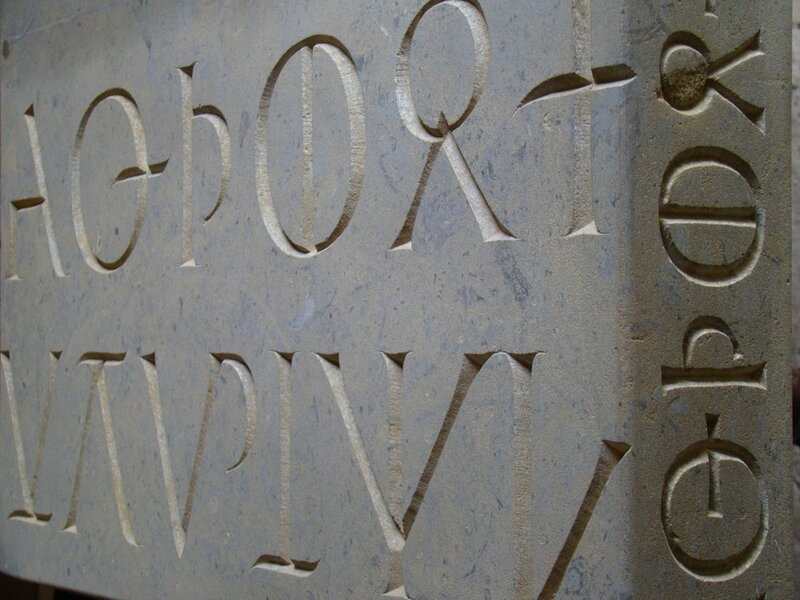 It boasts one of the most important private collections of lettering on stone. Join us for a private tour of the garden with its 1.5 acres arranged on three levels with substantial yew hedges, large borders and trees including a large copper beech and a Judas Tree. You will encounter lettering on stone dotted around the garden, including work by David Kindersley, Gary Breeze, Tom Perkins, and Teucer Wilson. Julian’s collection also includes sculptures by Peter Randall-Page and Mary Spencer Watson. Artist Ayako Furano, who has taken up a Journeyman Scheme through the Lettering Arts Trust and is a recipient of a Harriet Frazer bursary, will demonstrate the timeless craft of carving throughout the day. Tea, coffee, wine and light refreshments will be served. Alan Kitching demonstrates his letterpress skill as a compositor and printer, an artistry for which he has achieved world-wide renown. In conversation, Tom Sargeant, our seventh apprentice with Karoline Newman, followed by a guided tour of the 'Elixir of Letters' artworks. Chelsea Physic Garden hosts “An Elixir of Letters,” a unique collaboration between the Chelsea Physic Garden and the Lettering Arts Trust. This wonderful exhibition celebrates the theme of drink, and features works in stone, slate, and metal inspired by plants that are the ingredients in teas, tisanes, wines, cordials, beers, and herbal brews. It is a show that will slake the thirst of art lovers and gardening enthusiasts alike. “An Elixir of Letters” features standing stones and sculptures, sundials and ornaments created by 15 leading letter carving artists who took inspiration from the historic Chelsea Physic Garden to create works for this enchanting exhibition. The works featured celebrate the theme of Drink with inscriptions of poetry, drinking songs, and recipes. The artists showing their inspiring works at this beautiful garden in the heart of Chelsea include Martin Cook, Annet Stirling, Karim Lahham, Alyosha Moeran, and Charlotte Howarth. In conversation, Professor Phil Cleaver, Curator of ‘Berthold Wolpe – The Total Man’ and Deborah Hopson Wolpe, daughter of Berthold. Tickets free to Friends of LAT, £10 to other guests. Pay at Door. For all details and opening hours visit the Festival website www.aldevalleyspringfestival.co.uk.